Are you wondering if blue blockers are glasses that could benefit your eyes? 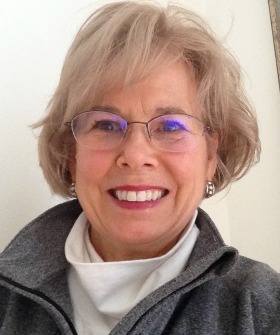 Eye Solutions is a company focused on prevention and slowing or stopping the progression of macular degeneration. They consider their Blu-Tech Lenses™ to be state of the art, and the “external” component to our “internal/external” protection for the patient. Dr. Gary Morgan has a thorough knowledge about Melanin Lenses and in fact, has authored a paper on this topic. He received his Doctorate of Optometry from the Illinois College of Optometry in 1992. He has been practicing in Arizona since 1993. Dr. Morgan enjoys all aspects of eye care including preventive eye health exams, contact lenses and the treatment of eye disease. 1. 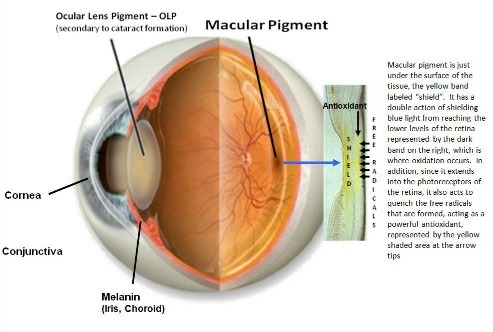 Explain to us how Ocular Lens Pigment (OLP) and melanin works and especially how it protects the eyes. To answer this it is helpful to visualize how light can damage the eye for which I have provided a diagram. There is much confusion over which type of light is most harmful to the eye. Recently, I was at a medical conference where the retinal specialist lecturing asked the audience of eye doctors which light is more dangerous to the eye, UV light or blue light? While there was no consensus from the audience, the retinal specialist stated it was blue light. He went on to describe that while UV light is dangerous to our skin, including our eye lid, as well as the ocular "skins" of our conjunctiva and cornea and can cause cataract, it is blue light that is damaging to our retina. Blue wavelength light is a major contributor to oxidative retinal damage that causes Age-related Macular Degeneration (AMD). The eye has 3 natural blue blocking components, Melanin, Ocular Lens Pigment (OLP), and macular pigment. Macular pigment found in the retina attenuates blue light acting as a shield and as an antioxidant (see figure above). 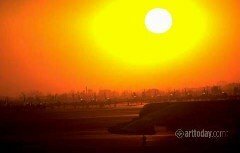 Melanin and OLP are the first lines of defense against blue light, acting as a filter. Melanin is found in our iris and its extension under the retina called the choroid. In the iris it blocks light from entering the eye and in the choroid it acts to stop the internal scatter of light, thus reducing glare. Melanin also has retinal antioxidant properties that we lose as we age. OLP is found in the lens of the eye and increases as we age to protect the retina; however the end result is cataract which is removed for better vision. This is perhaps why there is an increase in AMD following cataract surgery. 2. Tell us how you have been able to use melanin and OLP in your optical lenses. While melanin is important, a major breakthrough in ocular protection will be its combination with OLP in spectacle lenses. Melanin and OLP are created in the laboratory using a very precise patented process to mimic the natural protection found in the eye. This is then added to a liquid plastic monomer and cast into lenses. These lenses can be made for both indoor and outdoor use and will be available under the name Blu-Tech with HELP technology, HELP stands for High Energy Light Protection. 3. What are the benefits of wearing glasses with OLP and melanin for those with macular degeneration and for those without this retinal condition? Blu-Tech lenses will provide a primary ocular defense filtering blue light to reduce its oxidative effects for those with AMD as well as those at risk. Blue light also causes glare, so eliminating its effects significantly enhances contrast, which is particularly important for those with AMD as damaged retinal photoreceptors may cause difficulty with such tasks as reading a newspaper where the print contrast is poor. A retinal surgeon recently told me that he is looking forward to the availability of Blu-Tech lenses as he many times will have a post surgical patient with good acuity complain they cannot read. He feels this is due to damaged macular photoreceptors that will benefit greatly from the blue filtering effects the lenses will provide. 4. 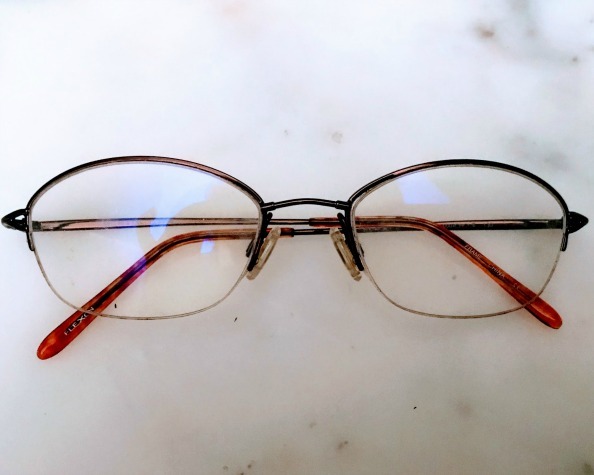 How and where are these glasses used or worn? Are there different lenses for different uses? In addition to the blue light we are exposed to outdoors (the sky is blue) we have a growing indoor blue light hazard. Compact Fluorescent Light bulbs (CFL) are replacing incandescent bulbs to save energy and our television, computer screens and digital devices are backlit by fluorescent and LED bulbs that have a high blue spectral emission. So the answer is when you are indoors, wear the indoor lenses and when outdoors wear the outdoor sun lens. Doing so will provide critical protection against blue light as well as significantly enhancing contrast providing a visually soothing effect. 5. Who would benefit from wearing melanin/OLP glasses? 6. Do glasses with melanin/OLP protect the eyes from ultraviolet light and/or blue light? Shorter wavelength light has higher energy and does more damage to tissue. Longer wavelengths are lower energy. For example, radio waves are well above the Infrared shown on the graph, very low energy, which is why you can not talk on a cell phone in an elevator. 7. If someone is interested in getting these new lenses how would they go about getting them for those with and without prescription eye wear? The easiest way is to go to www.BluTechLenses.com and send an email to info@blutechlens.com Indicate your name, contact information and current eye doctor if applicable. Eye Solutions will make it easy to obtain both the prescription and non-prescription Blu-Tech lenses for indoor and outdoor use.